As lovers of cheese, we didn't live in Manhattan long before discovering Murray's Cheese in the West Village. Murray's has an excellent selection, and their employees know everything there is to know about cheese (and they let you sample everything). 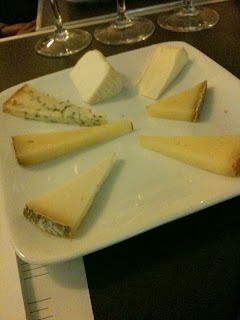 A few weeks ago, we decided to take one of their cheese courses - Cheese 101. It was well worth it! (5) Pecorino Foglie Di Noce - we're always fans of Pecorino; this one is aged in walnut leaves (foglie di noce) and was easily the best cheese of the night. At $30/lb it is a "special occasion" cheese, but pairs nicely with their tomato jam (I know, it sounds weird, but it's delicious). (6) 2 year Comte - Comte, a gruyere-like cheese, is normally aged for 1 year; this one is a special 2-year aged version that blows the 1 year out of the water [it's no longer available]. Also over $30/lb, we just couldn't spring for it -- the 18 month Comte available at Zabar's is a close second. Notes: The cheese course was a great time, they serve the cheeses with bread, nuts, and dried fruits, along with 2 glasses of champagne and 2 glasses of red wine. We learned so much about the cheese-making process, and found new delicious cheeses to buy. Some of the cheeses are exclusive to Murrays, but most can also be found at Zabar's (which is closer to us and has cheaper prices). If you like cheese and are in the area, you need to check out Murray's!